NYU Stern hosts the 4th annual Passport Day on Gould Plaza. 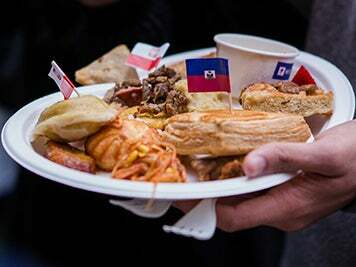 On April 7, NYU Stern students enjoyed food and music from over 20 different countries. 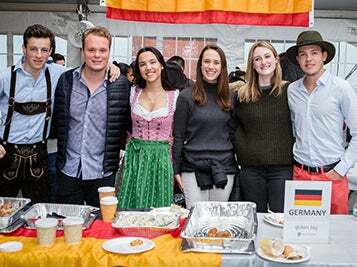 This year, Passport Day concluded Stern’s first ever Global Experience Week. Other events hosted this week included a global trivia competition hosted by the Stern Student Council and an International Student Panel hosted by the International Students Association featuring seniors speaking about their global experience. Passport Day highlights the importance of having a global perspective, one of the Undergraduate College's three guiding pillars. Additionally, it serves as a community building event that celebrates the many international cultures and backgrounds that Stern students represent. Visit the Undergraduate College’s Facebook page for a photo gallery highlighting Passport Day.